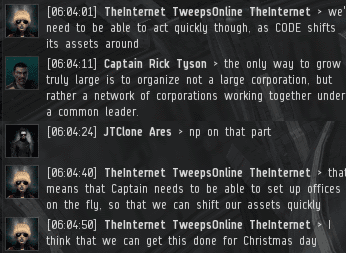 Previously, on MinerBumping... Rebel leader JTClone Ares' dreams came true when he was contacted by TheInternet TweepsOnline TheInternet and Captain Rick Tyson, who claimed to have a mole in CODEdot. 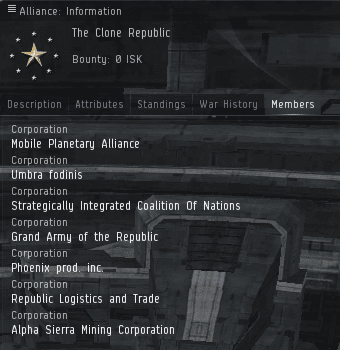 They told him they would pull a massive heist and transfer the assets to JTClone's alliance, The Clone Republic. 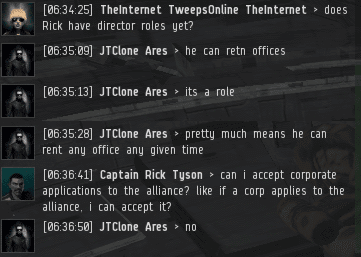 But to ensure everything went according to plan, they needed JTClone to give Captain Rick alliance executor corp director roles. 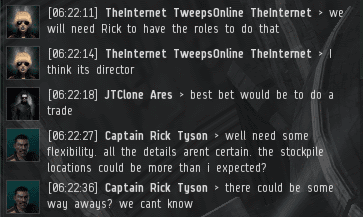 Rick and TheInternet firmly believed it was best to give Rick director powers, rather than relying on JTClone to do everything himself. Though he'd first met Rick only about an hour and a half earlier, JTClone was willing to put his alliance in Rick's hands. High risk, high reward. 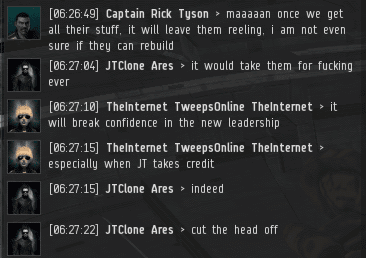 Before things progressed any further, TheInternet wanted confirmation that Rick had total control over JTClone's alliance. It was absolutely essential, if the heist were to have maximum impact. Rick, the newest alliance director, was busy wrapping Christmas presents. Once finished, he would get another update from his high-level spy in CODEdot. Then they would learn if the heist would be performed that night. The level of anticipation grew once again. 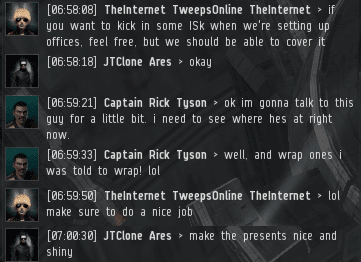 JTClone and TheInternet were willing to wait on Rick's present-wrapping task. Wrapping, like EVE heists, cannot be rushed. 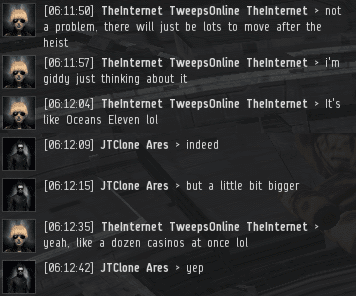 TheInternet got the idea to have EveNews24 publicize the heist after it was finished. 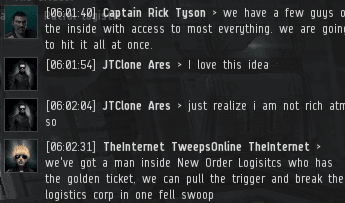 JTClone was ecstatic. 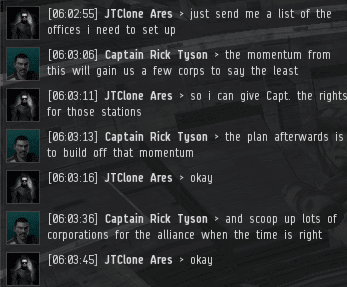 EVE's most trusted news source! JTClone imagined his portrait on the front page as The Clone Republic's glorious deeds were shared throughout the galaxy. As time went by, the heist seemed less likely to be performed that night. 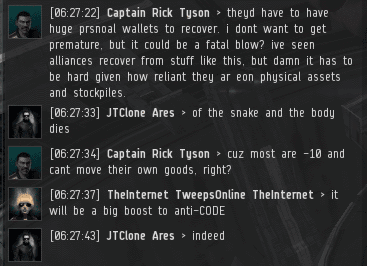 There were a lot of assets in CODEdot stockpiles throughout highsec, but critical personnel were still online. Those men could stop the heist. Better that the theft take place while they slept. TheInternet also believed that TheMittani.com would be interested in hearing about a successful heist. JTClone could use the extra publicity to support a carebear CSM candidate. JTClone was thrilled by the idea. Victory was within his reach. This feeling must be what New Order Agents experience every day! 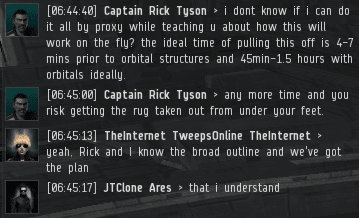 As they continued to await more information from Rick, JTClone and TheInternet discussed the implications of the heist for the umpteenth time. They both agreed that it would spell the beginning of the end of the New Order. 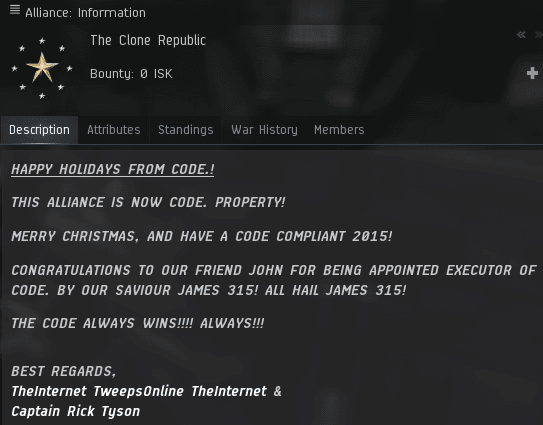 Now it was JTClone's turn to come up with a way to slap CODEdot in the face: Maybe the high-level spy could have CODEdot offer to surrender to The Clone Republic for three billion isk! JTClone cackled with delight. He could even use the heist as a jumping-off point for another anti-Code speech. Unless a Christmas miracle occurred, the New Order would surely be doomed. Life is about choices. 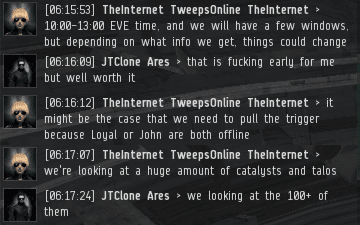 EVE is about choices, too. Let's consider some bad choices that were made by carebears during the week of December 21st @ 00:00 EVEtime through December 27th @ 23:59 EVEtime, and consider how we might help the carebears make better choices in the future. And just like that, any goodwill Sack R-A-T-T-E might have possessed went straight out the window. It's truly shocking to see there are still people who fly quintuple anti-tanked mining battleships these days. At least he had an escape plan, though--in the form of a 1mn microwarpdrive. Agents Ilithyia Borgia and Mal Warre somehow managed to catch up to the speedy miner and unleash the full fury of their Taloses. 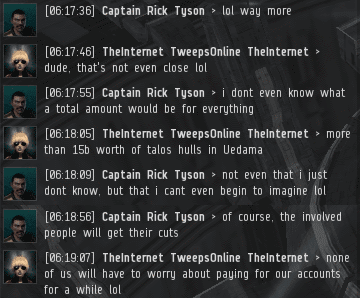 Agent Vanilla Mooses, inflicting 0 damage, got full credit for this piece of elite solo PvP history. How did she do it? You'd have to ask her, but I'm willing to bet that her faith in the Code played a crucial role. 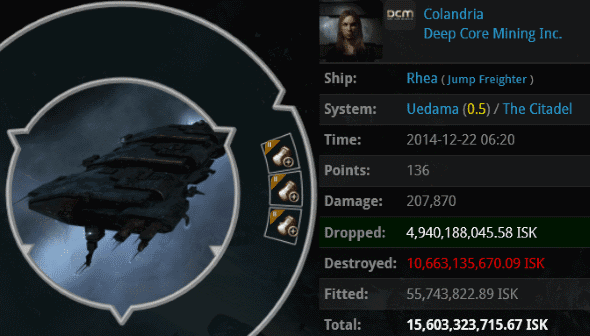 Colandria added to the death toll in Uedama this week with her 15.6 billion isk jump freighter loss. Naturally, she was anti-tanked, because who ever heard of a suicide gank in Uedama? When you think about it, every carebear who lacks a permit is anti-tanked. Agents unknown boat, Sophia Soprano, Braggs Seyllin, loyalanon, karma balancer, Amyclas Amatin, Chocolate Mooses, Globby, Jason Kusion, Quaker Oatmeal, reaper Shardani, Sasha Cohenberg, and Buhbye Rollard deserve highsec's praise for this kill. BONUS! A behind-the-scenes look at Kills of the Week! Competition for a highlight in a Kills of the Week post can be very fierce. There are so many misguided carebears out there. They suffer tremendous losses, all because someone on Reddit or whatever told them not to buy a permit. For example, this week, I felt it was important to highlight a dead Orca. Who would get the spotlight? I don't blame you if you need to take a moment to compose yourself after this kill. 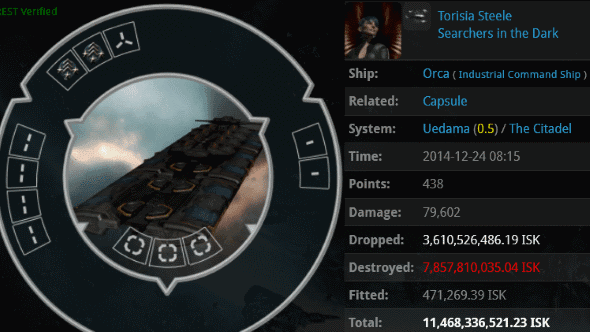 Torisia Steele lost a completely unfit Orca worth 11.4 billion isk. Carebears, do you really need to transport your BPOs through Uedama in an unfit ship? Consider alternatives, please. 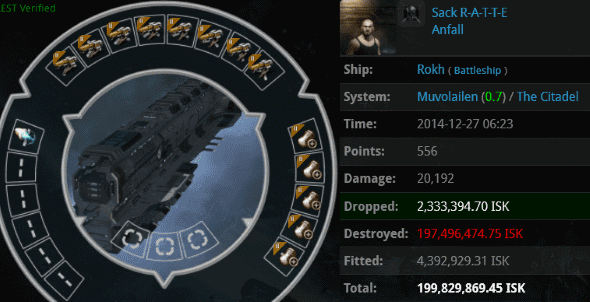 Agents Theodoric Darkwind, Norek Crendraven, Tisiphone Dira, Zombiepilot, Amyclas Amatin, Sasha Cohenberg, Quaker Oatmeal, DJ Rubbie, ZombieAgent, and Jason Kusion destroyed the Orca, which was worth more than many nullsec fleets these days. New Order sovereignty was enforced well. 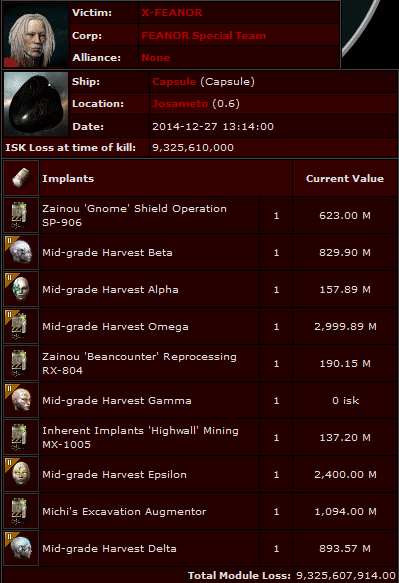 X-FEANOR's pod was worth nearly 10 billion isk, again adding in the value of an unrated implant. 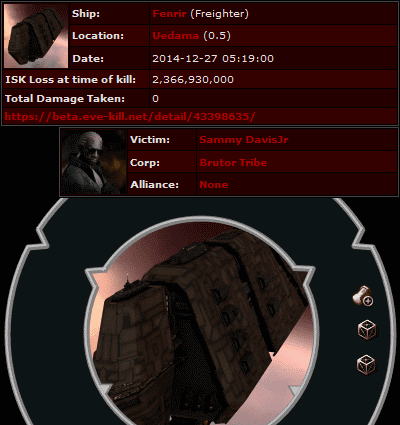 Agent Sasha Cohenberg landed the kill after X-FEANOR's freighter was popped. It was a rough day for ol' X-FEANOR; he lost not one but two freighters in addition to the pod. 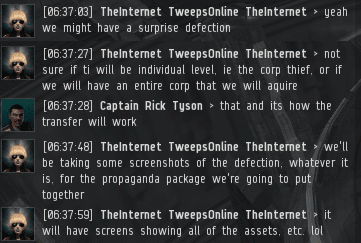 Naturally, both freighters were completely anti-tanked, because highsec is 100% safe and nobody needs to worry about those CODE. people. As a side note, X-FEANOR has lost several freighters over the last few months. 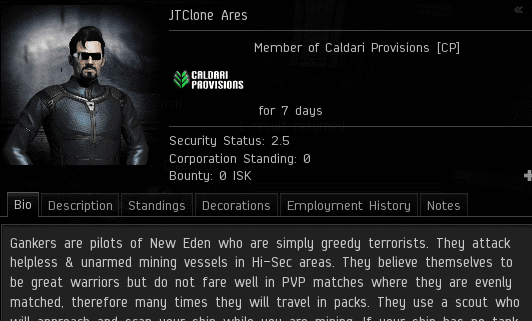 Carebear apologists, don't feel bad for him over that 10 billion isk pod loss, either: He lost another one of those to our Agents in October. He has only himself to blame. I'm very concerned for X-FEANOR. He should be considered unarmed and extremely bot-aspirant. 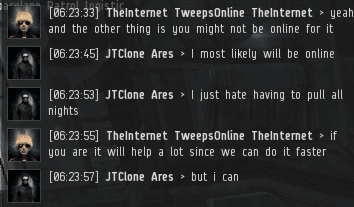 Odds are good that he's involved with botting, RMT, and/or other unsavory practices. 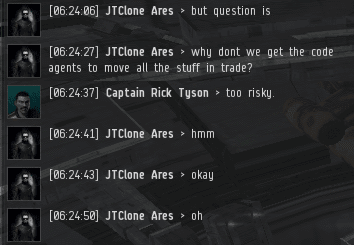 If you'd like to get a 10 billion isk pod on your killboard, you might want to engage in some PvP with him. 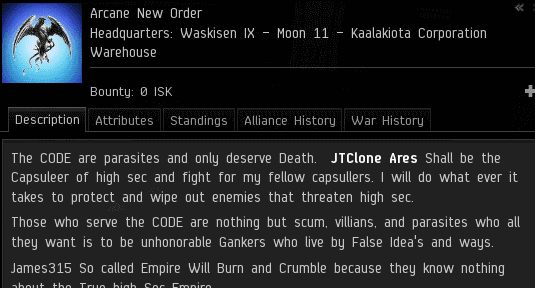 If not for the Code, how many other X-FEANORs would be out there stinking up highsec? Every carebear has a choice: Follow the Code, or lose everything you have. 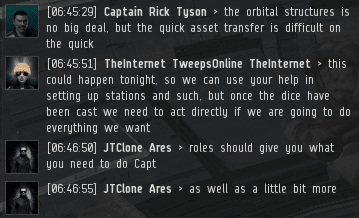 Keep highsec beautiful. The Christmas season has been filled with miracles. Certainly it would be a miracle if TDD Dominaters stopped exploiting newbies with his high-tax fail-corps. That's not the Christmas miracle I'm talking about, though. 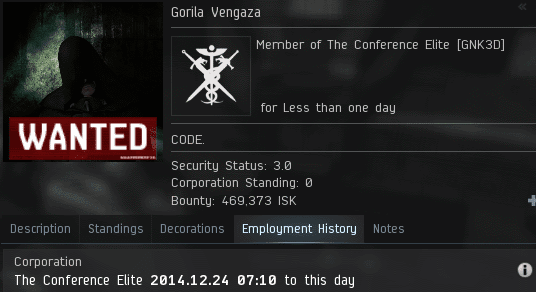 On Christmas Eve, notorious rebel leader Gorila Vengaza joined CODE. The "Anti-Ganking" channel was created by a carebear named Astecus. 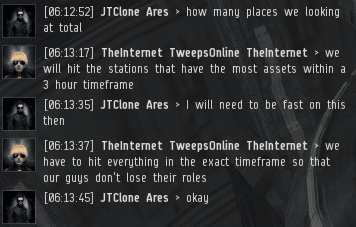 As founder of the channel, Astecus retained control no matter what. But Gorila had long been a moderator of the channel. And while Astecus slept, the New Order's newest Agent sprang into action. In a daring tour de force, Gorila removed the other moderators and appointed loyalanon as their replacement. Then came the masterstroke. 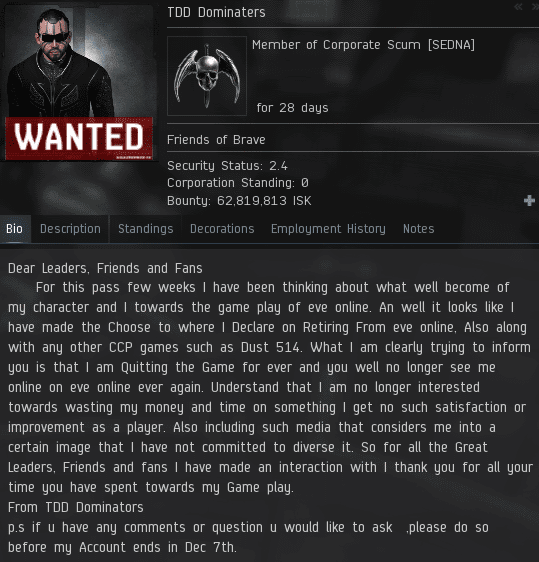 Since the beginning of Anti-Ganking's existence, Astecus and the other moderators had built up a ban list, comprised of "troublemakers". The ban list was built, brick by brick, until it contained over a thousand entries. It was not so much to keep people out, as to keep them in; it was designed to keep the rebels in a bubble where they could not hear dissenting opinions. The ban list was wiped clean, an action which could not be undone. The ban list would need to be built all over again. 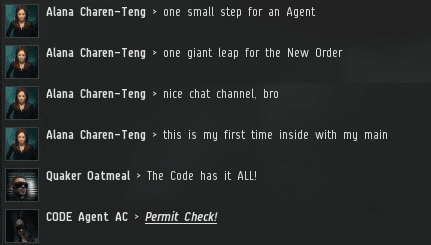 Anti-Ganking's Berlin Wall fell and New Order Agents came rushing in. Scorpions' "Wind of Change" blared from the speakers as our Agents embraced the poor rebel souls. Not every carebear was ready to accept their new freedom, however. Rumors spread like wildfire: Gorila Vengaza must have been hacked! 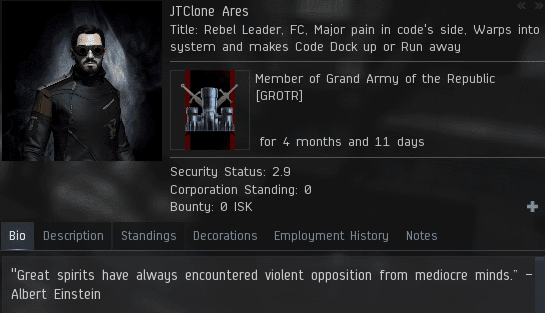 Rebel leaders don't say the Code always wins, do they? When the carebears finally accepted the truth, many of them were furious. 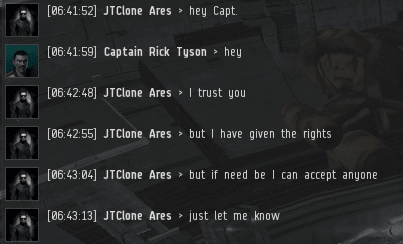 Highsec "mining consultant" (that gets me every time!) 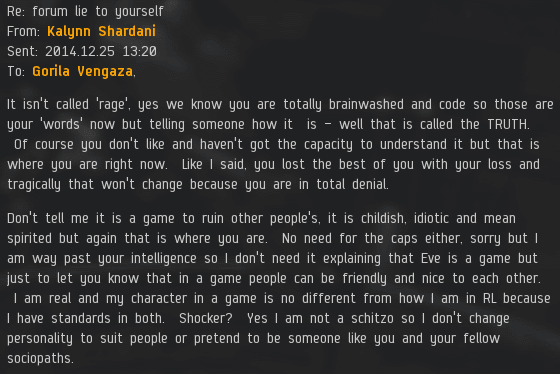 Kalynn Shardani sent a blistering EVEmail to her former colleague. 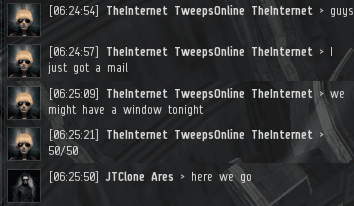 A few hours later, Astecus awoke to a bunch of alarming EVEmails. He ended the party and started banning people. But his prized ban list was gone, and no one could erase the memory of the New Order's triumph--a triumph that was but a foretaste of highsec's great future. Nor could the carebears get over the shock of Gorila's change of heart. ....Lately my biggest Issue has been the campaign of RL death threats and accusing people of being sociopaths and psychopaths because of how they play a GAME. It’s something I do NOT agree with and have actively campaigned against since day one. It’s a hate campaign Veers is very vocal about and sadly his sentiments have carried over to the AG channels and I’ve seen many embrace it. I’ve sat back and watched the hate and I do NOT approve. I do want to say there ARE some good people in Antiganking regardless of the others and if my actions hurt those people I do apologize. What I have found from the beginning is I’ve had more in common with CODE than anyone in AG. I can honestly say from experience is I’ve enjoyed my interactions with CODE more than many of my interactions with AG. I have felt many in CODE GET the game and what it means to play it. 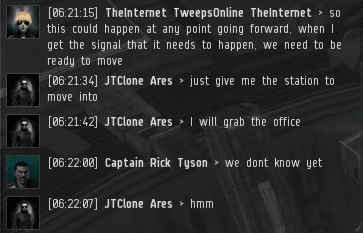 From 07 I have always understood that no one is safe in the EVE universe and nor should they ever be “SAFE”. You should also have FUN and be laughing when you play a game. Not many laugh in AG from my experiences there are MANY in CODE who do laugh and have FUN. 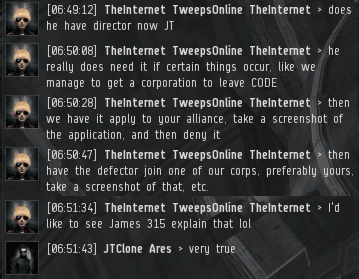 I’ve seen person after person claim to be the “normal players” while making death threats and other crap at CODE member’s children. 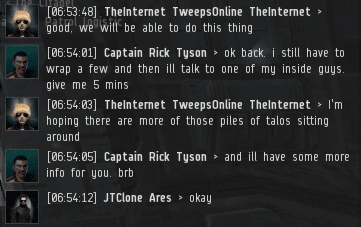 To me there is a HUGE difference in telling someone you’re going to hunt them down and kill them INGAME as opposed to making threats to key someone’s car or assault their children in RL. If that’s “Normal” I’d rather be a “psychopath” and play with CODE. 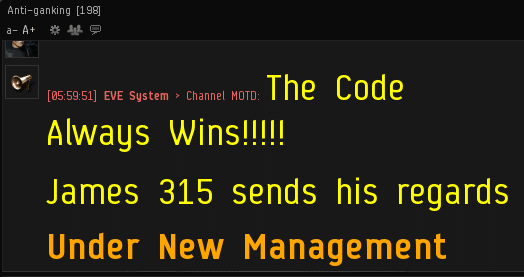 THE CODE ALWAYS WINS!!! ALWAYS! Getting Gorila to hijack the channel and delete the block list is a new low... even for CODE... and that's saying something. It's pretty pathetic to have absolutely no moral values or standards of common decency. Grow up. And we do have content... it just doesn't involve hurting other people. You can play the game and be a decent person, you cannot suicide gank and be a decent person. One can't help but be struck by the contrast: Gorila spent months leading the rebels and attacking the New Order, but he was welcomed into the fold by Agents with open arms. On the other hand, when Gorila took a step one millimeter away from the carebears' party line, they condemned him, called him a sociopath and a scumbag, and blocked him. In short, 'twas a Christmas filled with surprises for all.